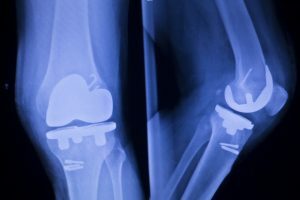 Although infections after knee replacement surgery are rare, orthopedic surgeons in Jacksonville, FL, want their patients to be informed about the risks and how to avoid complications from infection. The more you know about these risks, no matter how low, the better prepared you’ll be when recovering from surgery. There are two kinds of knee infections possible after replacement surgery: superficial and deep knee infections. Here are some things you need to know about these different types of infections. Superficial: This kind of infection usually occurs at the incision. Infections at the incision site often happen shortly after surgery while still in the hospital. Although, it’s also possible to develop a superficial infection when you get home. It’s important to treat superficial infections right away to prevent major problems from developing. Deep knee infection: Some patients develop infections around the artificial knee. Orthopedic surgeons often see these infections develop weeks or even years after the replacement surgery. In order to determine the right course of treatment, see your orthopedic doctor in Jacksonville, FL, right away if you believe there is a deep knee infection. Often, surgery is needed to correct the problem. Who Is at Risk of a Deep Knee Infection? All knee replacement surgery patients have some risk. However, if it’s been over 2 years since you had your surgery, your chances of developing a deep knee infection decreases significantly. It’s more common for people who have had the surgery in the past 24 months to develop this problem. Any of the above conditions can lead to an increase risk of infection. Talk with your orthopedic surgeon in Jacksonville, FL, about your risk factors before going through with knee replacement surgery. Prior to your surgery, your surgeon will go over the signs of infection with you. However, here are some things that you’ll want to keep an eye on over the months following your knee surgery. Your doctor will evaluate the situation and prescribe pain medication, additional surgery or different types of orthopedic therapy in Jacksonville, FL, to help alleviate discomfort. If you’re experiencing knee or joint pain and require knee replacement surgery, don’t be fearful of possible infection. When you work closely with orthopedic surgeons in Jacksonville, FL, you’ll have a lifetime of mobility from your new knee.